Mumford and Sons have closed this year’s Glastonbury festival, with their first ever headline set on the Pyramid Stage. The band began in the dark, playing the slow-burning Lovers’ Eyes, which opens with a lone vocal over feedback. The lights came up for second song I Will Wait – their only UK top 20 hit – and the crowd erupted. 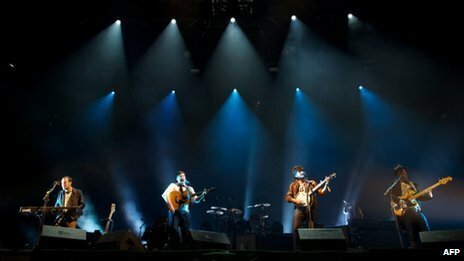 “We came for a party,” frontman Marcus Mumford said. The set was the band’s first since bass player Ted Dwane had surgery for a blood clot on his brain this month. They closed their set by playing the Joe Cocker version of A Little Help From My Friends, for which they were joined on stage by Vampire Weekend, The Vaccines and folk singers The Staves. This year’s Glastonbury Festival has seen 180,000 people descend on Michael Eavis’s Somerset farmstead. Sunday’s line-up included Vampire Weekend, Smashing Pumpkins, Jessie Ware, Bobby Womack and Sir Bruce Forsyth. Avon and Somerset Police said crime at this year’s festival has dropped dramatically since the last event in 2011. Mumford and Sons’ had said they would have pulled out of the headline slot if their 28-year-old bass player had not made a full recovery. The band were hit by the news of Ted Dwane’s condition while they were on tour in the US earlier in June. He had been taken to hospital after being described as “feeling unwell” for several days. “Nothing was more important than Ted’s health,” said Ben Lovett. The band took to a stage still vibrating from the barnstorming set from Saturday night’s closing act – The Rolling Stones. The veteran rockers received five-star reviews in most of the Sunday papers. Some fans in the audience, however, felt the sound was too quiet and there were scattered chants of “turn it up” during the band’s performance. Ben Lovett said the shows had made him worry that his banjo-brandishing band did not have quite enough hits to fill their show. “We’ve only got two albums, so we’ve got to write more,” he laughed. “But we’re match fit. We wouldn’t perform if we didn’t think we could do a great job. “It’s funny,” said frontman Charlie Fink. “Every time things get a bit bigger, you think <<I can’t believe it’s got to this stage>> and then something else happens. Another oldie making his debut was 85-year-old Bruce Forsyth, who emerged on the Avalon Stage to the Strictly Come Dancing theme and introduced himself as “The Rolling Stones 2”, before playing a set of music hall standards, including Gershwin’s Funny Face. The turn-out for Sir Bruce Forsyth was so large that security officers shut down the Avalon field for 20 minutes, as hundreds of fans spilled out of the tent into the field beyond. The notorious Sunday afternoon “Glastonbury legend” slot – which has played host to the likes of Shirley Bassey and Johnny Cash – was filled by country star Kenny Rogers. “I was told it was a special slot but I don’t always believe everything my manager says when he’s trying to get me to do something,” admitted the singer. Kenny Rogers added he was unsure whether the Glastonbury audience would be familiar with hits such as The Gambler, Coward Of The County and Islands In The Stream. “But I think any time you get that number of people together, percentage-wise I should have enough people who know my music to carry the rest of them. The 74-year-old, who is the seventh-biggest-selling artist in US history, also said he was hoping to see Mumford and Sons. “I saw them on a Country Music Television show in the States, and I thought they were excellent. “You know, my first 10 years, I played upright bass and sang in a jazz group – so I can really appreciate what they’re doing melody-wise and time-wise.